Typically, these spots involve Chevrolet subjecting a focus group of ordinary folks to some form of torture, be it the terror of absolute darkness, the claustrophobic nightmare of being trapped in an elevator, or the anxiety of having one’s personal space invaded. This time, though, Chevy isn’t inflicting any cruel and unusual punishment on ordinary people, other than forcing them to sit and witness man’s own inhumanity to man. In the new 30-second spot, a focus group of real people stares in abject horror at videos showing crazed Black Friday shoppers trample over one another in a mad dash to get their hands on discounted flat screen televisions. 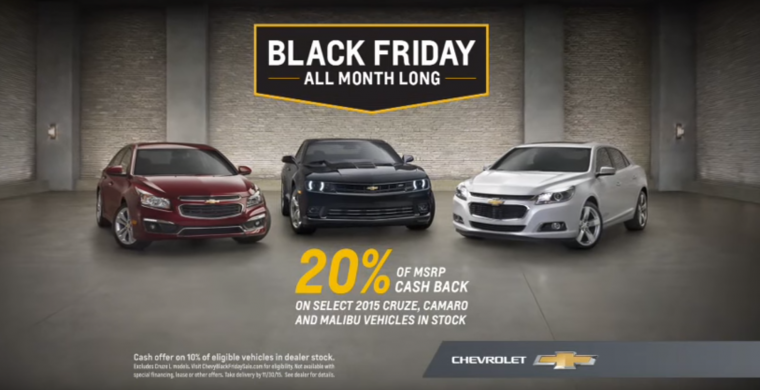 Then, the focus group leader announces that Chevrolet has come up with a solution to the hysteria: a month-long Black Friday event, which includes 20% off MSRP cash back on select 2015 Chevy Cruze, Camaro, and Malibu vehicles. Of course, most Black Friday shoppers are hunting for inexpensive holiday gifts, and probably aren’t likely to do their Christmas shopping at a car dealership, no matter how steep the discounts. But if you are in the market for a new car and feel like being your own Santa, November might be the time to take advantage of this deal.